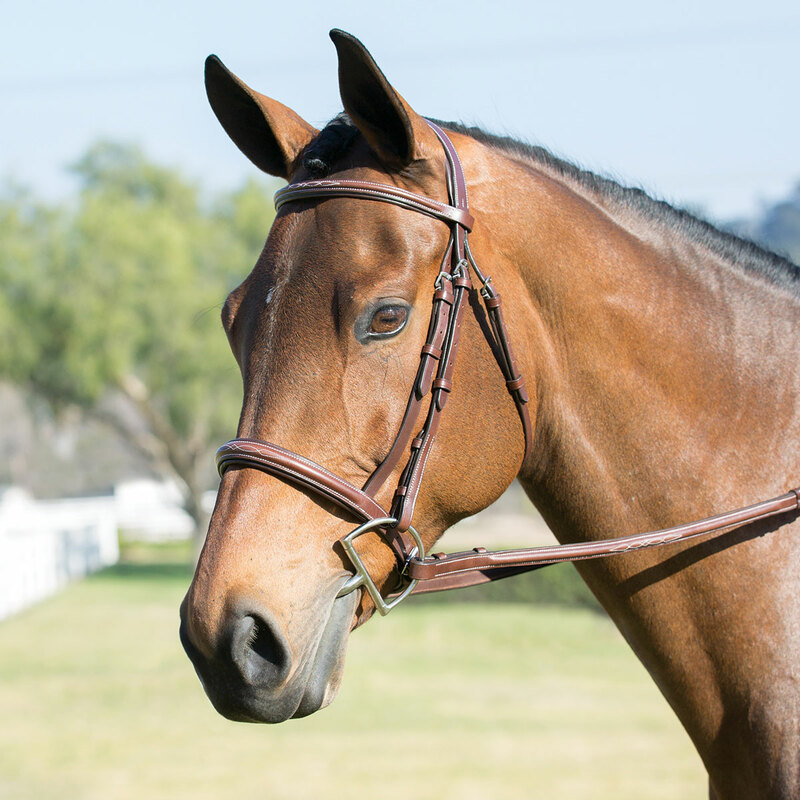 Harwich® Hunter Bridle by SmartPak - Walnut is rated 3.9 out of 5 by 11. Rated 4 out of 5 by Crittermom from Very Nice bridle This is a nicely designed and well made bridle. It so far fits 2 of my horses with very different shaped heads. The third has a refined nose and I believe I will have to add holes to the nose band chin strap. I have conditioned it twice so far, it is still in the "breaking in" process, but I am ever so slightly disappointed in the quality of the leather. The leather has some sort of finish on it that seems to make it resistant to conditioning, while at the same time making it more prone to "wrinkling". I think once it is fully broken in, it will be ok. Rated 1 out of 5 by MollyD from Poor quality leather After having this bridle for only a month the leather on the throat latch started to crack. Now after 6 months more areas on the bridle are cracking. I take excellent care of my tack and for the price this is very disappointing. Rated 5 out of 5 by TFD2016 from Very nice I originally bought this bridle because of its cheaper price for my hard to fit draft cross until I could find a nice bridle that I didn’t have to piece together with multiple sizes. I ordered the full size and it fits perfectly with a few holes to spare. I was also pleasantly surprised by how nice the leather was. It was a little dry when I got it but softened beautifully after an oiling. It definitely looks much more expensive than it is. This could easily be used as a show bridle. I am impressed with the quality of this bridle. Rated 5 out of 5 by Hotisthis1 from Very good bridle for the price I've had a Harwich bridle for about ten years and I still get many compliments on it. It doesn't have the fancy stiching on the brow or noseband, it is rolled. It has a very neat appearance and is less bulky because the cavesson threads through the crownpiece. The leather has held up very nicely including the reins. I clean and condition my tack regularly. My only complaint is that I have had to have it restiched near the buckles. But for its age and regular usage, I'd expect this from any leather good at any price. It's been an outstanding value for the price! Rated 5 out of 5 by Horse Lover from Very nice bridle! I bought this bridle over a year and a half ago and it has held up just great, and I ride 5-6 days a week. The padding on the crown and nose is nice. The stitching is very classy! I clean my tack every day and I have not experienced any bleeding of the leather. I get lots of compliments with this bridle and I ride western, but most everyone else rides English at our barn, and it goes nicely with western or English saddles. 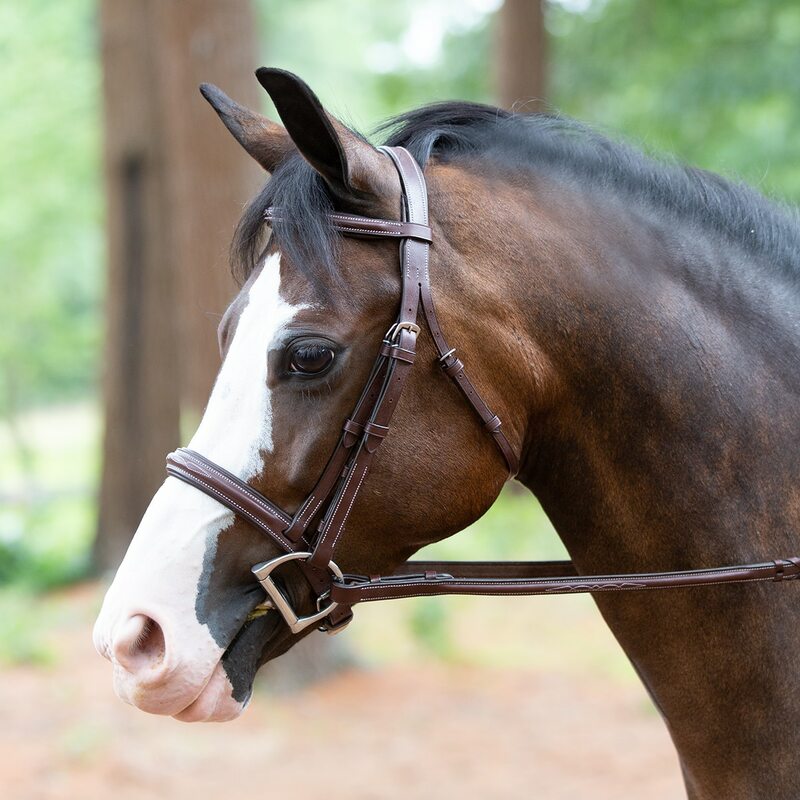 I can't say enough good things about this bridle. For the price, you absolutely can't beat it! I will probably purchase another if and when I should need another! Rated 5 out of 5 by Monty from Beautiful bridle!!! 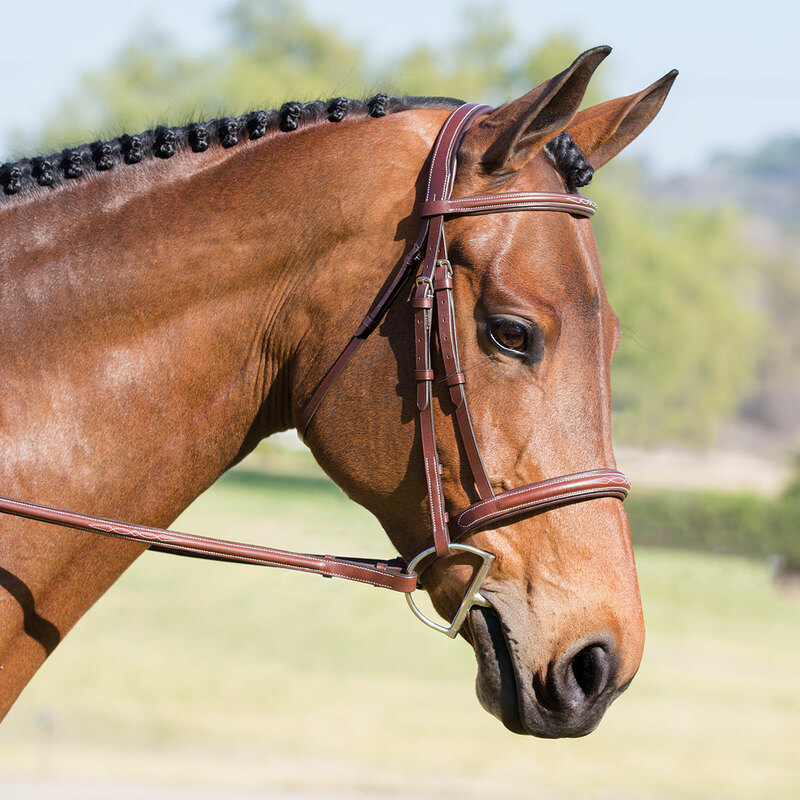 This bridle is absolutely gorgeous. Well worth the money. Rated 5 out of 5 by TopBrass from Very nice Bridle Just purchased this bridle. I have 2 older Harwich bridles that have held up very well to everyday use. This one is just as nice and soft before oiling. Great for the price. Nice enough to show in. Rated 5 out of 5 by Bslick from Beautiful! Bought this a month ago and have already gotten a ton of compliments! Fits my guy well, feels great, looks awesome! Rated 3 out of 5 by lzeeman007 from Blah color and average leather I wanted to love this bridle but just couldn't. The color is very drab and not at all like it looks in the picture. I still want the bridle in the picture! The leather quality was average at best. Rated 1 out of 5 by Badgerfan from The leather won't stop bleeding I really wanted to like this bridle - on paper, it has a lot going for it with the padded monocrown, decent price point, etc. Unfortunately, from the first time cleaning the bridle, the leather won't stop bleeding a purplish dye that has stained the fancy stitching a pink/purplish color.